My wife loves the movie, "Out of Africa". 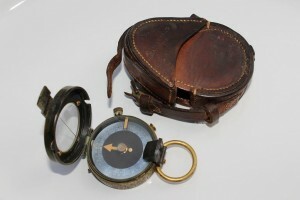 She was especially touched by Denys' gift of a compass to his friend and later companion, "Karen Blixen". So for my wife's birthday this year, I found this compass made in 1916, approximately the same time Denys gave his compass to Karen so she could always find her way. I presented my compass to my wife, saying, "should we ever become lost to one another, she could use this compass to find her way back to me". It would also be very useful, for my wife loves to hike. In fact she climbed Mt. Kilimanjaro in 2011. 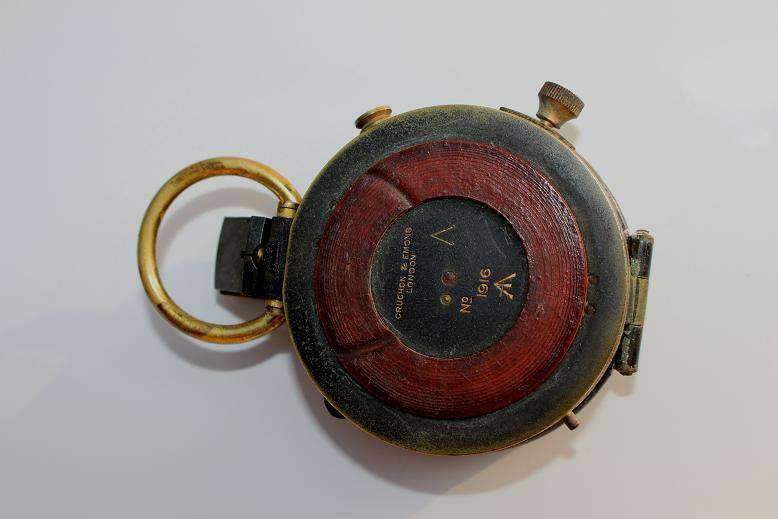 This is a WW1 Verners pattern MKVII military marching compass with leather case, dated 1916. Made by Cruchon & Emons London. It has also the military arrow. Has the traditional mother of pearl dial, for low light reading with the orange direction arrow intact. The brass lid has a strong hinge and a brass knob on the side for transit locking of dial. The compass has also a magnifying lens for precise angles calculation (for target engagement). The compass and leather case are in excellent condition. 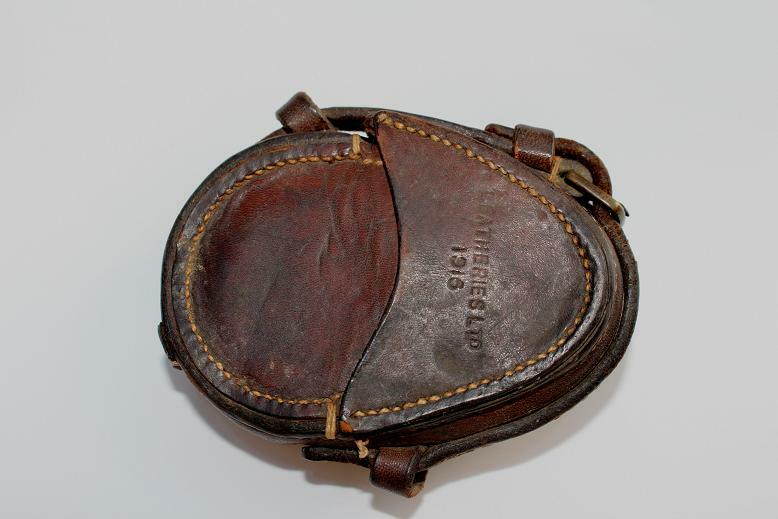 The leather case is stamped LEATHERIES LTD. 1916. This is a fine example by a quality maker. The compass measures 5.4cm in diameter. Verners Pattern compasses are both incredibly popular with collectors as well being a compass that can still be practically and easily used today. The most common models are the Verners Pattern VII and Verners Pattern VIII which were mainly used during World War 1. Their basic construction is a prismatic dry card compass with a both a momentary bearing lock and transit lock. Colonel William Willoughby Cole Verner was born in 1852 and commissioned into The Rifle Brigade in 1874, retiring in 1904. He served on the staff in the Egyptian campaign of 1884-85 and during the Boer War. He died in 1922. Whilst the basic prismatic compass design has its origins in Schmalcalder's patent of 1812 (Patent No 3545), Verners Pattern is a significant development which can be traced back to 1895. 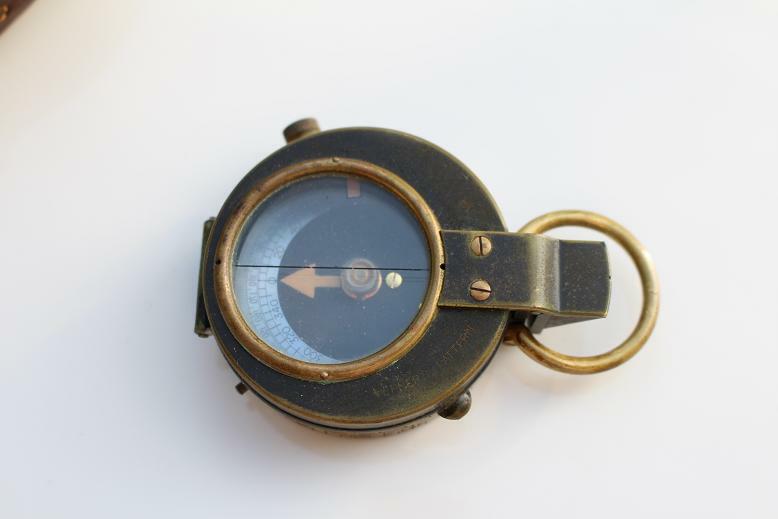 In 1895 F Barker produced a Verner Compass (nos 327) and J H Steward produced both a Verner compass, a Major Verners Sergeants compass and a Major W Verner's Patent Night Marching Comapss which were all pocket compasses and not prismatic compasses. All had distinctive compass card markings. Around 1905 the term Verners Pattern with a model number was used starting with a Verners Pattern V. Generally the compass card is the main area of change in the early models and some of the basic features are evident from the model V through to the VIII and the IX of WWII.